Enjoying the exhibits at Poetry & Posies are Regina Schuster of Elma, Beth Kruszka of Colden and Barbara Kruszka of West Falls. 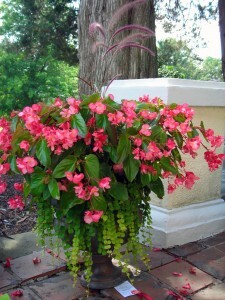 Container plantings are so versatile. If your outdoor space is limited to an apartment balcony, a container can serve as your entire garden. Containers can also decorate porches and patios, or fill in bare spots in a larger garden. They can be created in any style. 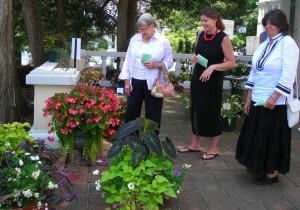 Visitors got lots of great ideas for container plantings at the Poetry & Posies standard flower show of the East Aurora Garden Club on Saturday and Sunday, July 31 and Aug. 1. The titles for each of the categories in the show was the title or first line of a poem. The planters were in “The Garden of Love” section. Each of the entries was required to use three or more different plants, explained Marty Mummery, a member of the East Aurora Garden Club who received a third place ribbon. Other factors in judging include the overall shape of the arrangement and the condition of the blossoms. Take a look at these photos to get ideas for your next container planting. Chris Hartmann received first place for her container, shown above at left. The sword-like leaves of the dracaena draco not only provide height, they are an unusual chocolate brown color, which is echoed in the color of the pot. 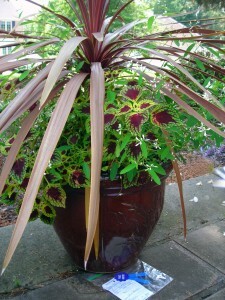 Dark heart coleus stays in the same restrained color palette with its green and dark purple leaves. The aptly named Diamond Frost euphorbia adds tiny sparkles with its white blossoms. At right, a pink angel wing begonia (dragon wing) is the centerpiece of the container arrangement by Carol Rockhill, which won second place. A delicate yellowish green lysimachia nummularia “Goldilocks” (Creeping Jenny) cascades down to the stem of the pot. A feathery pennisetum setaceum rubrum (Purple Fountain Grass) adds height and texture. 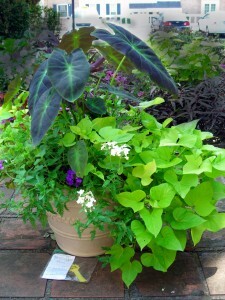 Marty Mummery mixed shades of green and purple in her container planting, shown below left, which won third place. The dark green, large-leafed plant is illustris elephant’s ear (colocasia esculenta). The bright green plant spilling over the side on the right is Marguerite sweet potato vine (ipomoea). The blossoms peeking out of the middle are white verbena (tukana) and dark blue verbena (superbena). On the left is regal geranium (pelargonium domesticum) in a color called maiden deep lavender. Below right is a container just bursting with color. It was entered by Patty Hearn-Alessi and received an honorable mention. 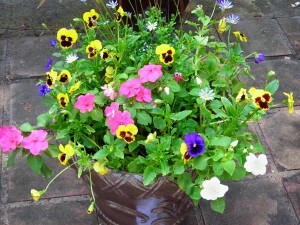 This charming container is anchored by viola tricolor in purple and yellow, along with impatiens in pink and white. It is accented by periwinkle blue flowers with a delicate, daisy-like blossom called Felicia amelloides. The East Aurora Garden Club holds its flower show every other year. On alternate years, it holds a garden tour. 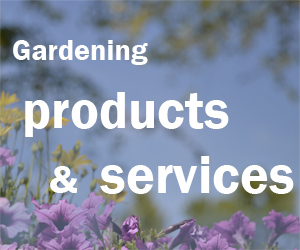 The East Aurora Garden Club meets at noon the second Monday of each month at St. Matthias Church, 374 Main St., East Aurora.